2014 წლის 15 მაისს, თურქეთის დედაქალაქ ანკარაში, კოჩის უნივერსიტეტთან არსებული ვეჰბი კოჩის სახელობის ანკარის კვლევის ცენტრის (VEKAM) ორგანიზებით ჩატარდა პირველი სიმპოზიუმი სახელწოდებით ”Cultural Encounters in Anatolia in the Middle Age: The Kingdom of Georgia and Georgian Art” (შუა საუკუნეების კულტურული კავშირები ანატოლიაში: საქართველოს სამეფო და ქართული ხელოვნება). სიმპოზიუმის საროგანიზაციო საქმეებში აქტიურად იყო ჩართული საქართველოს საელჩო თურქეთში. სიმპოზიუმი წელს პირველად ჩატარდა და ყოველწლიურად სხვადასხვა თემატიკას მიეძღვნება. 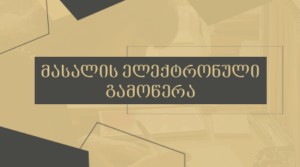 აღსანიშნავია, რომ პირველი სიმპოზიუმი სწორედ ტაო-კლარჯეთს მიეძღვნა. სიმპოზიუმში მონაწილე ქართველ მეცნიერებს შორის იყვნენ ხელნაწერთა ეროვნული ცენტრის დირექტორი, ბუბა კუდავა, რომლის მოხსენება ეხებოდა ახლად აღმოჩენილ იშხნის ციხეს, და მეცნიერ-თანამშრომლები – ნიკოლოზ ჟღენტი და ნათია ხიზანიშვილი მოხსენებით „ტაო-კლარჯეთი: ხელნაწერი მემკვიდრეობა და სხვა მოძრავი ძეგლები“. მოხსენება შეეხო ხელნაწერთა ეროვნულ ცენტრში და სხვა ქართულ და უცხოურ წიგნთსაცავებში დაცულ ხელნაწერებს, რომლებიც შექმნილია, ან გარკვეული პერიოდის განმავლობაში ინახებოდა ტაო-კლარჯეთის ტერიტორიაზე. 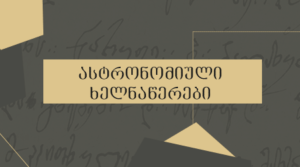 On May 15, 2014 in Ankara, the capital of Turkey was held the first symposium – Cultural Encounters in Anatolia in the Middle Age: The Kingdom of Georgia and Georgian Art. The symposium was organized by the Vehbi Koç and Ankara Research Center (VEKAM). In organizational affairs of the symposium actively took part Georgian Embassy in Turkey. The symposium was held for the first time in 2014 and it was dedicated to Tao-Klarjeti. Every year the themes of the symposium will be different. 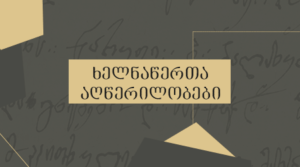 Among the Georgian scientists who participated in the symposium were the director of the National Centre of Manuscripts, Buba Kudava and the scientific workers Nikoloz Dzgenti and Natia Khizanishvili. The lecture was about the manuscripts preserved at the National Centre of Manuscripts or at different Georgian or foreign libraries. These manuscripts were created or kept in Tao-Klarjeti. It is planned to publish the materials of the symposium.